Blue Origin’s reusable rocket, which just made its fourth trip to space, hit an apogee of 331,501 feet. It then touched down easily, like we’ve seen in previous flights. But the real action on this test was to see what happened to the crew capsule it was carrying. 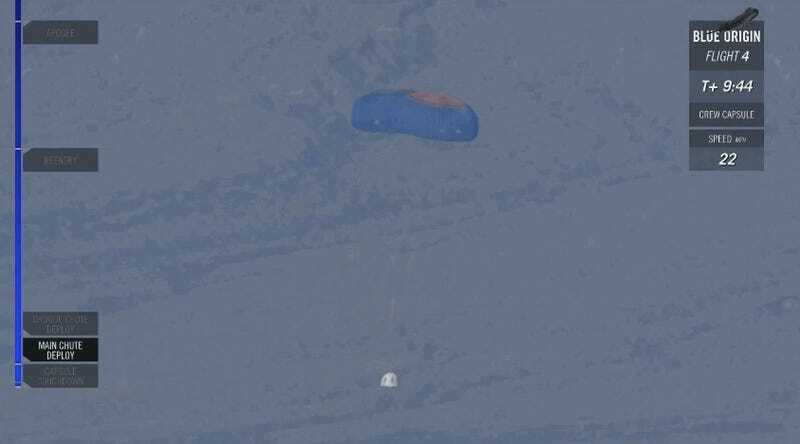 Still—despite that heavy cloud of dust it kicked up at touchdown—the capsule appeared intact at the end. Although, for a full-workup of how the capsule did, we’ll need to wait until Blue Origin retrieves it and checks it out. Assuming all went well, that same rocket and capsule will go back up in a future test flight. Update 6/20, 10:15 am: Blue Origin spokesperson Julie Arnold contacted us to say that the landing speed shown by Blue Origin’s speed monitor—which in their broadcast is shown as going directly from 19 mph to 0 mph—was not its actual landing speed. “The retro rocket fires a fraction of a second before touchdown. The mph on the screen did not update fast enough to show the true speed at touchdown,” said Arnold in an email. The speed after the retro rocket fire, says Arnold, was 1-2 miles per hour.